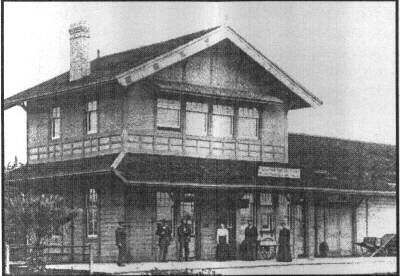 For years, the Chatworth train stop, like most commuter train stops around Southern California, consisted merely of an outdoor platform where people waited in pouring rain and scorching heat. The Whistle Stop Coffee Depot offers much more. In the moments before dawn, commuters in business attire hurry from the darkness in the parking lot toward the cream-colored train depot at the northwest corner of the San Fernando Valley. The wheels of the 6:18 Metrolink, which began to run in Oxnard, are now rolling through the tunnels of the Santa Susana Mountains, minutes away from the Chatsworth station, which until two years ago, wasn't much more than an open-air platform. Now two friendly sisters run the Whistle Stop Depot and dispense not only smiles and good humor in the early mornings along with hot drinks but also schedule information. "Do you want some sugar with that hon?" asks Phyllis, who tends to her customers with motherly care. "That train doesn't go all the way to Oxnard", she advised another. The Chatsworth property lies between Devonshire and Lassen streets, split by Old Depot Plaza Road. The building was built in an Old West style to reflect Chatworth's site history as a stagecoach stop in the 19th century and the place where former Chatsworth residents Roy Roger and Dale Evans filmed many of their TV episodes. The railroad dynamited a tunnel through Santa Susana pass where horse-drawn coaches once labored up the slopes. The site was then served by a smaller train station and served as both a freight and passenger stop for years. In the 1960's, Southern Pacific announced it would tear down the building because of a lack of traffic. Residents wanted to preserve it as a historical site, but railroad crews arrived during the night and destroyed it. Trains continued to stop there for the next two decades. And in the 1990, Southern Pacific announced plans to build a lumberyard at the site, which prompted protests from residents. The MTA was forming Metrolink around the same time and the commuter train service needed stops. MTA together with the city of Los Angeles, used an 8-million grant from the state to buy the property from the railroad. A citizen advisory board was formed to help formulate a master plan for the land. First, a passenger platform was built to accommodate the Metrolink runs, which began in 1992. Then construction began on the actual building. The building was dedicated in April 1996, with Roy Rogers and Dale Evans attending. Any use of the animations or files should have prior approval.